The MBA studies were made from January 2008 to December 2010. 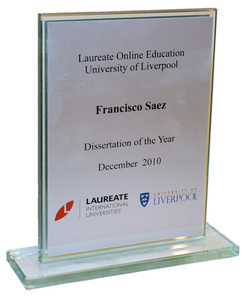 The last year was dedicated to the research and preparation of the Dissertation. The title is 'Exploring the success of Joint Ventures in the Food Manufacturing Sector of the Chinese market'. It received the award 'Dissertation of the Year 2010'. It is a research about how the Joint Venture (JV) experience worked for four different foreign companies when entering the Chinese market. A choice of companies for the study was made so that two of them have been successful in their JV, and the other two have failed. The companies studied for their successful JV were Tyson foods (poultry, with Shandong Xinchang) and Chiquita (fruits, with Haitong Food). The companies studied for their failing JV were Danone (desserts, with Wahaha) and Fonterra (milks, with Sanlu). a) Event Study (using descriptive statistics, and inferential statistics: parametric and non-parametric). b) Time Series Analysis (finding a suitable model and comparing the forecasted evolution with the real one). a) Mean-adjusted market model (using the mean return during the previous year). b) Market-adjusted market model (using the respective stock exchange index). c) Market- and risk-adjusted market model (including also the risk associated to the company’s stock). All of these techniques allowed developing an extensive framework from which to analyse the evolution of the companies’ stock during 15 days after the announcement of the start or the termination of the JV.